The Tim Card is a pre-paid, reloadable cash card that you can use to pay for purchases at participating Tim Hortons restaurants. It is the convenient and easy way to pay! 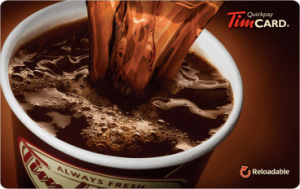 Tim Hortons Gift Cards are available in an Electronic Delivery format!